Man, Iowa is having a TOUGH time. The people, pets, everything. It is rough. 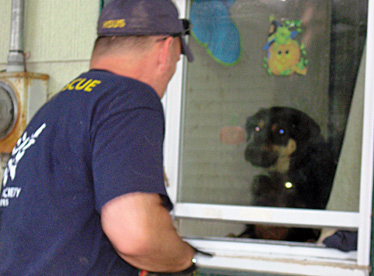 Get an emergency plan together for your pets! Donate here to Humane Society Flood Fund! That's so Bleening wonderful, savin' all da animals. Those kitties are named Fry and Bender. Hee hee. Wow -- that (hunky) blonde guy REALLY deserves a medal! Not only are those poor scared kitties clawing him up, but he looks pretty sunburned, too. It's been pretty horrible here in the midwest and my next door neighbor state is in a mess - if you can afford to help out somehow- Red Cross or Humane Society, or both, it would be great. We've been pretty lucky where I'm at, we're not near a river or major creek... but it's been soggy and it's supposed to keep being soggy for a few days still, rain until next Tuesday. The crops are getting ruined, and I'm blathering... God bless those rescuers and the people who are suffering right now. Oh thank goodness for these kind hearted people. My heart goes out to everyone in these floods, but especially those that can't help themselves. Thank you so much, rescuers! The look on that cat's face in the top right picture made me donate! They SHOULD make a Men of the Humane Society calender! Sign me up for 10 of those calendars. Will the animals be in the picture too? seriously, can we make a calendar or at least a booklet, poster or something to purchase and to get people to donate to the Humane Societies of the Mid West? It is a wonderful idea- I'm in! Can I help in any way? I'll certainly donate, by check, off-line. Not that I know what the circumstances are with the pets pictured, but there's is no way in H*** I would leave without my pets - no way, no how! If it came to me dying with them if I didn't leave, that's what would happen. Oh, poor babies! I was listening to NPR the other day about the pet rescues. I don't know what circumstances these people had to leave in where they couldn't take their pets along with them, but it's good to know the little darlins are getting help. I would have to be dragged (or even drugged!) forcibly from my home without Mr. Wuv Wuv, but I can't judge what those people were going through when they had to evacuate. 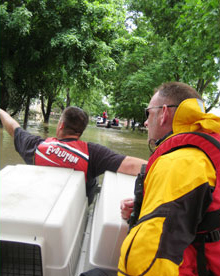 I want the blond rescuing me if we ever get flooded! Seriously, awesome job these people are doing. People too often forget their pets in times of crisis. It's understandable, but tragic. Thanks to everyone who has helped or is looking to help. I'm here in Illinois 10 blocks from the Mississippi, and while my house (and dog!) are on high ground & OK, lots of my neighbors (and their pets!) are in trouble. They've lost a lot & they're just one of many organizations you can donate to. They are a no-kill shelter & a good friend of mine got his cats there, so I love them very much! The link to the Humane Society regarding preparing to evacuate with your pets is excellent. Even though Arizona is devoid of most natural disasters, I'll be making up an emergency kit pronto. Thanks for the PSA, Meg & Co.! Awesome job, keep it up. Awwww! I wish I could physically be there myself! The puppeh in photo #2 looks very anxious to be rescued! I dare anyone who claims that animals cannot feel the emotions that people do, to look at that top photo of the cat's expression and deny that that anguished, confused little face is so eerily like any human face whose world has just been turned upside down. 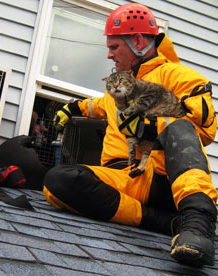 These rescuers are real heroes and deserve all the support we can give. I will do what I can. When San Diego caught on fire last year, there were so many pet rescues, and many pets needing to be taken in afterward when the owners could not be found or had lost their home. SO if you're in a neighboring state, or on high ground, give a thought to taking in another furry loved one if you can.. They are our unconditional love, and you can't replace that with anything. I'm not usually so sappy, but these people are real heros. NObody deserves to die in a flood. 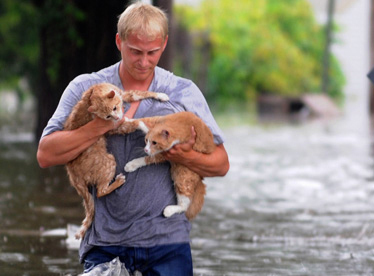 I saw the bottom pic up on CNN a few days ago, and assumed that the blond fellow was rescuing his OWN cats. No baggage, no valuables, just his kitties. Pets know when everything has gone to he**. We had to leave our house for a week after flooding in 1996 (water filled the basement and came up just past the middle of the sidewalk) and the two cats we had at the time were so incredibly good about it... got right into their cat carrier and behaved like angels all week while we were staying with friends. And they were such a comfort to have. I hope these critters all get back with their hoomanz promptly. I'll take two of those hunky blonde cat-rescuer men, please. Pearl, one situation I could imagine is what if you're at work (or just away from your home for some reason), and your house gets flooded while you're away, and they won't let you back? I know I might get whomped for this, but if it were me and my home was being flooded, I'd sure try as hard as I could to get my pet out, but in the face of a dozen family members thinking about my safety, it's very possible I wouldn't be allowed, for my own safety, to get my pet. Sad, but it's the truth. I suspect many people are in a similar situation. It's sad, but I'm glad the Humane Society has been able to help a lot of these animals. Yeah, it's been really awful here...the flooding has taken a toll on everyone. (my boyfriend had four feet in his formerly finished basement in Waterloo, north of Cedar Rapids). Thanks to everyone who donated! "My human said not to let ANYONE in the house, 'SPECIALLY through the window!" I just want to urge people to either leave an obvious sign somewhere in or outside of your home to let emergency authorities know you have a pet inside the home. I have a sticker on the outside of my door that says I have a pet, and it's in case of emergencies. Everyone should do the same, it would help rescue authorities significantly in case something were to happen. I know I'd sure like to be rescued by at least two of the guys pictured here. Yeah its been horrible around here. I live in upper Illinois and the Rock River is the highest that it has ever been in my lifetime (Thankfully my parents are on the high side of the river and no flooding yet *knocks on wood*) anywhoo I work with a local fire department and we spent the last few days getting pets out of homes. What I see happening alot is people dont want to believe that it is going to get that bad and dont leave (or they cant) and then they are stuck and have to get rescued by boat. Now alot of times what happens is there isnt enough room on the boat (as horrible as that sounds) What we do on the department is get everyone on the block to dry land and then go back for your 'namls. So I guess a word of advice, if they say its going to flood get ready, when the river gets scary and you have an out...take it. We sent a few fire fighters down to Iowa to help out and its hard to believe. Not has bad as Katrina but close. I'm a long-time lurker, but the pic of the bewildered, bedraggled tabby caused me to come out of hiding. He looks like my Bogie and my heart just broke. Yes! This is why I have been donating to them every year since Katrina. Imagine the shock, confusion and fear of the animals left behind as the waters rise...and then, someone comes to get them! How great!! I love that top cat who's just not feeling any of this but is willing to go with the flow. I know what you mean by hunky animal rescuers. If Animal Planet put one out for their various hot "Animal Cops/Precint/whatever" guys, I'd pick up one. Seriously, hot chippendale-ish guy in uniform rescuing puppies and kiitens? Like those hot Houston cowboys? The burly NYC cops with newyawk accents? The proper Britsh lads with their English complexions? All of those other cities? I can't even imagine how awful everything is for folks in the midwest right now, people and animals. worlds of thanks go out to anyone helping others!! And keep pet carriers handy so you don't have to leave suddenly with your fluff behind. Oh how awful!! I can't imagine my little ones being left behind in a flood but thank goodness for these guys! Aww, this post made me cry. Thanks, CoffeeCup, for reminding me to get one of those "I have a pet" emergency stickers. We have a new(ish) dog, and I had forgotten that we need one of those. snf. I imagine it's typically the people are not home when the flood rises and then they can't get back. I think most animal people learned from katrina, don't leave them behind. But obvy you can't take them to work with you. THanks to all who rescue and hugs to the people out there in the midwest. Hang on. and Kar, I watch Animal cops/precinct all the time but have not seen any English ones. What am I missing? Thanks, Meg, for posting the "donate" link. I'm here in London, ON, Canada with my own two kitties thinking how devastated I'd be if we were caught in a similar situation, separated from them with no way of knowing if they'd be safe. Thinking about all those volunteers and anipals' humans wrenches my heart terribly. Best wishes to all of those individuals, families, and animals affected by these crises. I have been working with the Iowa City Animal Care and Adoption Center for the last few days. I volunteer there regularly (2 to 3 times a week) and their facility has now been flooded with 4-5 feet of water. It is a wonderful, wonderful shelter--almost no-kill--and I am so sad for their loss. It was my favorite place to go to volunteer after a hard day at work because the animals and staff were all so loving. Our facility is destroyed, but we have set up a temporary shelter and are now housing their shelter animals, dozens of flood-induced strays, and animals brought in by their owners. We are working our butts off to try to keep all our ani-pals safe and would appreciate any help or kind thoughts you guys have for us. Visit http://www.icanimalcenter.org to learn how you can donate to rebuild their shelter. Bonus: click on "Adoption" to read about and see cute pictures of all the wonderful pets waiting for their forever homes! And thanks, CO, for featuring this story! Here is the direct link to donate to the Iowa City Animal Care and Adoption Center, which is funded by the Friends of the Animal Center Foundation! Oh, and I just read an article today which described the difficulties some owners were having in finding their pets in the shelters- the reason why many people were extremely reluctant to do so in the first place. I keep a tent in my trunk. I figure if I have to bug out, the animals come with me and have a place to stay. The rabbit will be problematic, as he may gnaw his way out, LOL. If you are planning for disaster, then line up disaster buddies who will take you and your pets in. I think Motel 6 allows pets, btw - but its good to make friends 10+ miles from home who can take you in for a bit. Theo, you are very funny. Um, know what's bad about that blond guy with the two cats? This makes me cry - in a good way! I love knowing others care the same way I do. And I am in the N.O.T. leaving without my pets camp. Do you know how many people during Katrina said the same thing? "It won't be so bad and I can come back soon." People! If it's not safe for you to stay - It's not safe for your pets to stay. And many hotels/motels make exceptions in these types of emergencies. Shelters are another matter. We have learned a little bit from Katrina but obvy not enuff. ConCATs tew awl whoo ar saivin kittehs. Saiv um AWL!